This article is about the American actor. For the English 17th-century Quaker, see Richard Farnsworth (Quaker). For the American politician from Maine, see Richard Farnsworth (politician). Richard W. Farnsworth (September 1, 1920 – October 6, 2000) was an American actor and stuntman. He is best known for his performances in The Grey Fox (1982), for which he received a Golden Globe Award nomination, and The Straight Story (1999), for which he received a nomination for the Academy Award for Best Actor. His sudden death followed a long struggle with prostate cancer. Farnsworth was born on September 1, 1920 in Los Angeles, California, to a housewife mother and an engineer father. He was raised during the Great Depression. When he was seven, Farnsworth's father died. He then lived with his aunt, mother, and two sisters in Downtown Los Angeles. Farnsworth enjoyed a long marriage and had two children. After becoming a widower, he lived on a ranch in Lincoln, New Mexico. On October 6, 2000, after a long battle with metastatic prostate cancer, Farnsworth committed suicide by shooting himself at his ranch. He is interred at Forest Lawn Memorial Park in the Hollywood Hills of Los Angeles in the Columbarium of Purity (N-63294) beside his wife, Margaret née Hill (1919–1985). In 1937, age 16, Farnsworth was working as a stable hand at a polo field in Los Angeles for six dollars a week when he was offered employment with better pay as a stuntman. He rode horses in films such as The Adventures of Marco Polo featuring Gary Cooper and performed horse-riding stunts in films including A Day at the Races (1937) and Gunga Din (1939). Farnsworth was employed on the set of Spartacus (1960) for eleven months where he drove a chariot. From stunt work, Farnsworth gradually moved into acting in Western movies. He made uncredited appearances in numerous films, including Gone with the Wind (1939), Red River (1948), The Wild One (1953), and The Ten Commandments (1956). Farnsworth received his first acting credit in 1963 and went on to act in western films and also television shows. He had a role in Roots (1977). In 1992, he co-starred with Wilford Brimley in The Boys of Twilight. His breakthrough came when he played stagecoach robber Bill Miner in the 1982 Canadian film The Grey Fox. He appeared as a baseball coach in The Natural (1984). Another prominent role was the suspicious sheriff in the film version of Stephen King's Misery (1990). Farnsworth became well known in the Pacific Northwest as the groundskeeper who saw the mythical "Artesians" in the 1980s Olympia Beer advertising campaign. Note: Farnsworth was inducted into the Hall of Great Western Performers at the National Cowboy & Western Heritage Museum in Oklahoma City, Oklahoma in 1997. In addition, Farnsworth received a Hollywood Walk of Fame star for his contributions in the motion pictures on 1560 Vine Street on August 17, 1992. 1951 Adventures of Kit Carson, TheThe Adventures of Kit Carson Henchman (uncredited) Episode: "Fury at Red Gulch"
1954 Adventures of Kit Carson, TheThe Adventures of Kit Carson Army Wagon Driver Episode: "The Gatling Gun"
1955 Soldiers of Fortune Gaucho (uncredited) Episode: "The General"
1956 Zane Grey Theater Trooper Episode: "Star Over Texas"
1958 Adventures of Wild Bill Hickok Butler Episode: "Jingles on the Jailroad"
1959 State Trooper Caleb Smith Episode: "Lonely Valley"
Rebel, TheThe Rebel Trooper Episode: "Yellow Hair"
Manley (uncredited) Episode: "Street of Hate"
1961 Laramie Hank Episode: "The Tumbleweed Wagon"
1965 Big Valley, TheThe Big Valley Bolin Episode: "The Odyssey of Jubal Tanner"
1966 Big Valley, TheThe Big Valley Businessman Episode: "Image of Yesterday"
Benefiel Episode: "Journey to a Hanging"
1970 High Chaparral, TheThe High Chaparral Lloyd Episode: "The Long Shadow"
1971 Bonanza Sourdough Episode: "Top Hand"
Troy Episode: "The Saddle Stiff"
Episode: "He Was Only Seven"
Little House on the Prairie Wall Episode: "Quarantine"
1987 CBS Summer Playhouse Carl Episode: "Travelin' Man"
Highway to Heaven Grandpa Jet Sanders Episode: "A Dream of Wild Horses"
"Richard Farnsworth". The Times. October 9, 2000. Retrieved 2009-10-19. "Richard Farnsworth, Stunt Man And 2-Time Oscar Nominee, 80". The New York Times. October 8, 2000. Retrieved 2009-10-19. 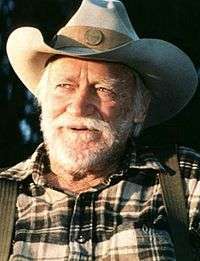 "Actor Richard Farnsworth dies". BBC News. October 7, 2000. Retrieved 2009-10-19. ↑ An L.M Montgomery Resource Page. "Richard Farnsworth". Tickledorange.com. Retrieved 2010-04-17. ↑ Silverman, Stephen M. (July 16, 1998). "Richard Farnsworth: Suicide". People. ↑ "Richard Farnsworth (1920–2000) – Find A Grave Memorial". www.findagrave.com. Retrieved 2015-12-25. ↑ "Margaret Hill Farnsworth (1919–1985) – Find A Grave Memorial". www.findagrave.com. Retrieved 2015-12-25. ↑ "Richard Farnsworth | Hollywood Walk of Fame". www.walkoffame.com. Retrieved 2016-08-23. ↑ "Richard Farnsworth". latimes.com. Retrieved 2016-08-23. The Cowboy Kind Farnsworth wrote the foreword to this book by Darrell Arnold. Published posthumously in 2001.